Cover graphic is a detail of a report in the Aug. 18, 1994 Woodstock Times, "Contaminated Dorm Gets Partial Cleanup," re-published on Dioxin Dorms. It's been twenty years since the PCB and dioxin explosions at SUNY New Paltz. More than 25,000 students have passed through the contaminated dorms -- and many of their friends and family have visited them and risked exposure. Numerous students have become seriously ill after living there or even visiting. We have just one question: who is going to tell them what happend? 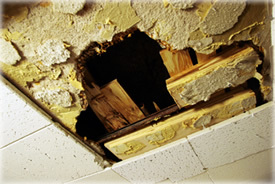 Hole in the Bliss Hall drop ceiling leads to a place that is a probable reservoir of contamination. Photo from August 2007 by Eric Francis. 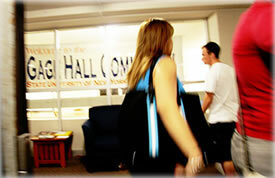 Students come and go from contaminated Gage Hall in the spring of 2007. Photo by Eric Francis. Carol sums up the situation in New Paltz simply: "Convince the students -- those who bear the risks -- that their right to know and their right to say no are at stake." This chronology, based on original research and press reports, goes from the early days of PCB manufacture into the first days of the New Paltz incident, and takes you through late 2000. Part two will be forthcoming. In the newest article of many, a state health department official admits that there is no way to say the SUNY New Paltz dorms are really safe, and says that hidden areas are reservoirs of contamination. This article is in the current edition of Chronogram. There are two prior articles in this series: From Blacksburg to New Paltz, and Growing Up. Both are located on the Planet Waves site, and also appeared in Chronogram, along with many other articles in recent years. Some others are listed on this page. This 1993 front-page article from Albany Metroland sums up the New Paltz situation from top to bottom perhaps better than any other in our archives. Though it's more than 14 years old, very little has changed in that time. This article from Chronogram tells the incredible story of the 2004 independent tests of the heat and vents in Capen and Gage halls. It's perhaps the clearest example of how difficult it is to get information out on campus. As editor of Student Leader news Service, Eric Francis Coppolino published this report less than one month after the initial PCB and dioxin explosions at SUNY New Paltz. This document provides a rare, contemporaneous view of the events of December 1991 and January 1992. Ventilation ducts are crucial in a PCB incident, because they are always the main route by which the toxins are transported. (Elevator shafts work great, too.) The dorm vents have been a big issue -- or rather, non-issue most of the time -- in New Paltz, because properly addressing the vents can cost tens of millions of dollars. This is a 2007 statement from a local community member and SUNY parent who actually has a clue. For years, indeed, since the beginning, state officials have played games with the ventilation system issue. They've denied the existence of vents, and denied that the vents were contaminated. This article lays out the issue meticulously. It's excellent background for two articles below, the Woodstock Times series that begins with SUNY Dorm Tests Toxic. This article is from 1993 (a big year in this story's history) and it contains details that will help you understand how the cleanup was conducted. 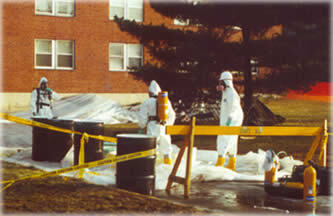 Cleanup workers in Level B protection outside Bliss Hall days after the explosion. 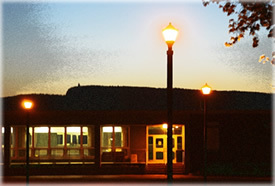 No students were in the building at the time, which was closed for winter break. Photo by Eric Francis for Student leader News Service. The first groundbreaking report published in 1992 documents that the heat system in Bliss Hall spread toxins through the building. So why didn't health officials test the heat in the other dorms? And more to the point, why do they refuse to do that testing today? The New York Times discovered Eric's reporting early in his work, and one of its columnists published this article on the front page of the Sunday Metro section in early 1993. This put Eric's investigative reporting on the national news radar. After a one-year investigation, Eric and Dr. Ward B. Stone of the state Department of Environmental Conservation determined that the vents in Gage Hall were indeed contaminated. This led to the partial cleanup, described in the next article. Continuing the article above, the local health department and state cleanup contractors did their own research and -- after years of saying the Gage Hall vents were not contaminated -- determined that 39 out of 40 vent outlets contained unacceptable levels of toxins. This series won a first place award from the New York State Press Association. Dr. Peter Haughton, the campus physician at SUNY New Paltz, on Dec. 30, 1991 -- the day after the explosions. His face sums up the mood of the day. Photo by Eric Francis for Student Leader News Service. SUNY New Paltz paid a $158,750 fine to the Environmental Protection Agency for its bungled handling of PCBs and for ignoring federal safety regulations before the 1991 disaster. This article details the college's misconduct. The New Paltz investigation led to research into the 50-year history of PCBs, and how the companies that created the chemicals and equipment in New Paltz knew in advance that disaster was imminent. This link takes you to Sierra magazine's site. An article telling many stories of environmental traitors in American history: journalists and scientists who sold out. How did Jennifer Folster die of leukemia? Was it because she lived in a hot spot in Capen Residence Hall? This article looks at the potential implications of life in a New Paltz dorm, and of the "background level" of dioxin in society. People often ask me if I know whether anyone who has become ill as a result of living in the dorms. This article documents two possibilities. Dioxin Dorms will soon be launching a national disease registry for SUNY New Paltz alumni. Meanwhile, this article from 2000 was my last piece in Woodstock Times, also my editor Parry Teasdale's last edition with the paper. In this astonishing article from early in the investigation, SUNY New Paltz administrators justify putting students into contaminated dorms. They admit the contamination -- but claim the levels are harmless, a claim that is deeply disputed. 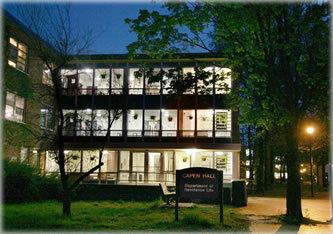 Capen Residence Hall at SUNY New Paltz, pictured in the spring of 2007. Photo by Eric Francis. This article in American Journalism Review from 1993 nails Keith Schneider of The New York Times for his fraudulent reporting on dioxins. Keith's articles became gospel truth. (Read more about him in the Banana Peel article above). Accompanying the article above, this sidebar looks at the conduct of the Washington Post. In this 2004 article from the Chronogram archives, Eric looks at problems with the NYS Department of Health's theories behind the New Paltz cleanup. Dioxins: An Overview for Physicians by Arnold Schecter, et. al. 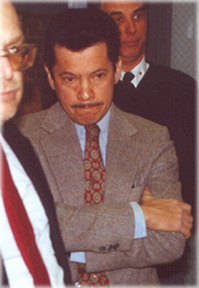 Dr. Arnold Schecter, former health commissioner in the Binghamton area, supervised New York's "other New Paltz" disaster -- a PCB fire in a state office building in 1981. He went on to become one the world's premier experts on dioxin toxicity. This is a PDF. Concerned about health effects of exposure? This off-site resource, created by Dr. Theodora Colborn, will tell you what you need to know about the effects of tiny doses of dioxins and PCBs on the human body. Dioxins are one of the biggest scandals going. Here, legendary Canadian investigative reporter Peter von Stackelberg looks at the issue in a 1989 edition of Greenpeace magazine. A Google search the other night turned up this vintage 1971 article on PCBs from TIME magazine, published five years after the original story broke in New Scientist magazine. There are a number of factual errors even in this short intro (PCBs are neither colorless nor odorless) but what the heck, Time admits they exist. Parker Theater was severely contaminated in the 1991 electrical incident. It is now open to the public, shown in front of the Shawangunk Ridge that is emblematic of New Paltz. Photo taken 2007 by Eric Francis. At Commencement 1992, just four months after the electrical disaster, this satire of the commencement program was handed out at graduation. It caused quite a fuss. It has many contributors - including Bebbin, Jason and Jae. A tribute to those who died in Auschwitz. We believe that state-sponsored killing with toxic chemicals is one issue, whether that chemical be Zyklon B or dioxin. These powerful photos were published last October on Planet Waves.